The picture on the left is a picture I took when this recipe was originally published 2 years ago. The picture on the right I took recently. I’ve put a lot of work into it and have improved the styling and the quality of my photographs, which is great. But the recipe…. it hasn’t changed. And these beans are seriously delicious! 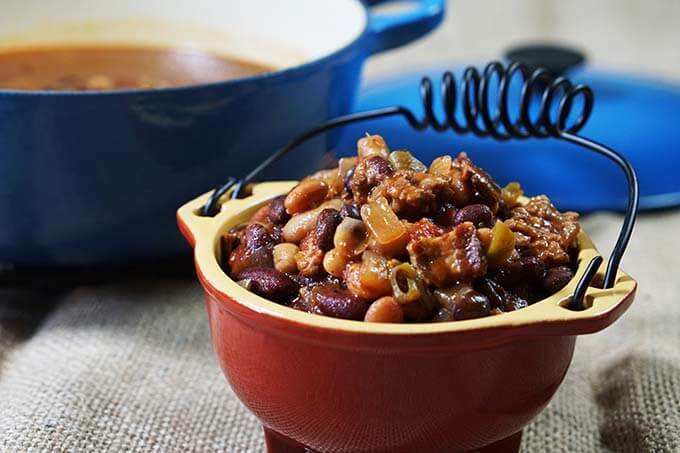 Baked beans are always a hit at a barbecue and perfect for a picnic. I’ve made them in the slow cooker and also on the stove top and in the oven, so you do what works best for you! Whichever method you prefer you get the same pot of deliciousness at the end. FREE Cheatsheet and all my cooking tips and tricks! Click here to subscribe to the blog today! 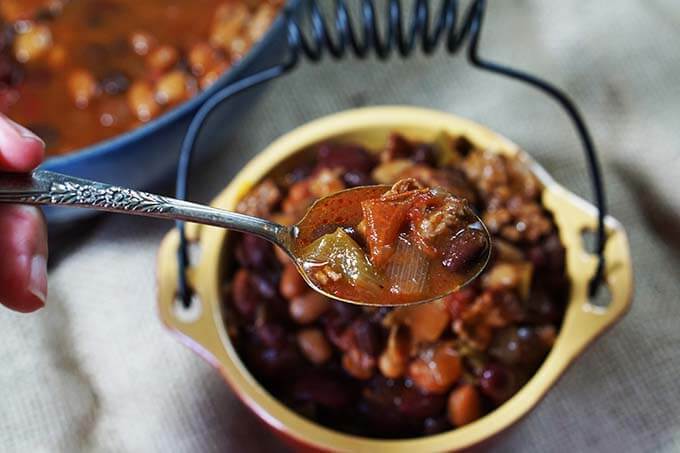 These Slow Cooker Baked Beans have great meaty flavor with the added bacon and sausage. The barbecue sauce and brown sugar add the sweet flavor you’re looking for. Making them in the slow cooker? Well that makes life easier! Start by sautéing the bacon & sausage on the stove (if you have one of those fancy slow cookers that sautés also you can eliminate that step and do that right in the cooker), then just chop the veggies, open and drain the cans – mix it together and toss it in the slow cooker and set it on low and all the hard work is done! Eight hours later and the beans are ready. Another method is to make this one on the stove top. If you make this on the stove, complete all of the above and place into a heavy bottom pot. Turn on low and allow to cook on the stove for 1 hour 30 minutes. You can also place these in the oven and slow cook them at 300 degrees for two hours. Use whichever method you’d prefer. 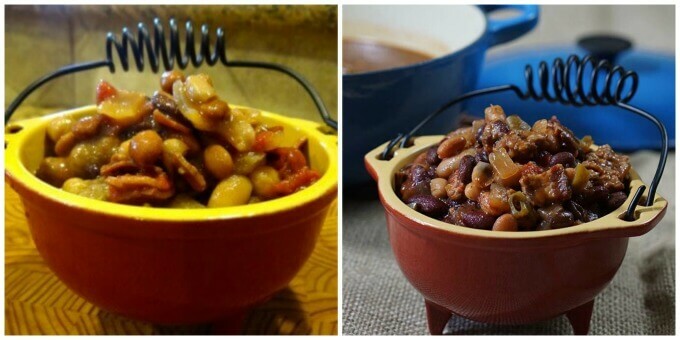 If you love a great pot of beans as much as I do, then you will really enjoy this recipe. The beans are sweet with just a hint of spice. They are delicious and so flavorful. They also freeze really well. 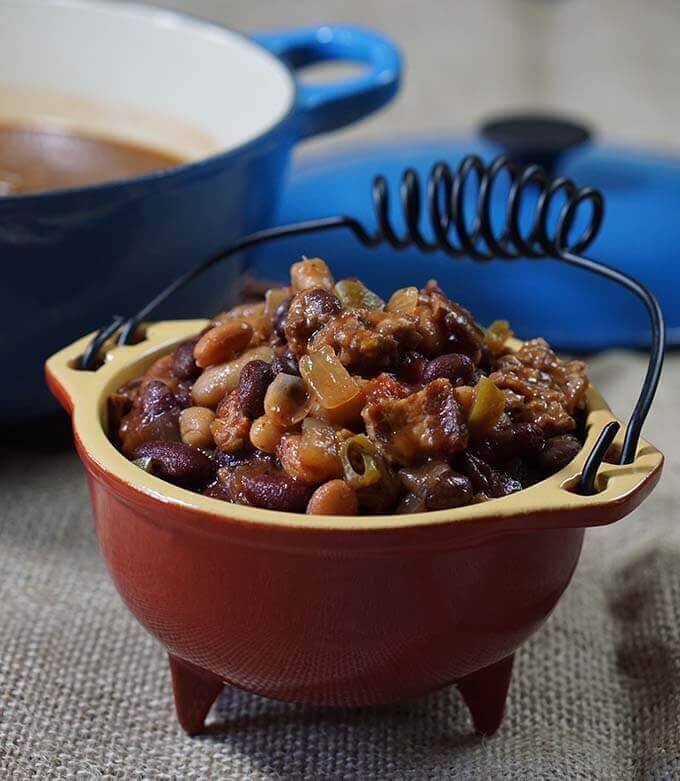 Let’s put this pot of slow cooked beans together and enjoy them tonight, YUM! 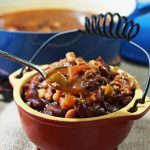 Slow Cooker Baked Beans - These beans are sweet with just a hint of spice. They are delicious and so flavorful. They also freeze great! 4 15.5 oz cans beans drained - I used kidney black, cannelloni and; garbanzo beans, but don't be limited by that. Use your favorite beans! Chop the bacon and sausage cook on the stove until the fat is rendered from the bacon and the sausage is well browned and crumbled. Remove the bacon & sausage and drain on a paper towel to remove excess fat. While the meat is cooking chop the onion and peppers. Open and drain all of the cans of beans and pour it into a slow cooker. Add the remaining ingredients; crushed tomatoes, barbecue sauce, brown sugar, dry mustard, onions & peppers. Add the sausage & bacon and mix to combine. Cover tightly, set your slow cooker on low and cook on low heat for 7-8 hours. If you make this on the stove, complete all of the above and place into a heavy bottom pot. Turn on low and allow to cook on the stove for 1 hour 30 minutes. You can also place these in the oven and slow cook them at 300 degrees for two hours. Use whichever method you'd prefer. Simple and delicious! Great for a cookout or game day and such an easy and fabulous side dish! « White Bean Turkey Stew because it’s Soup Season! This looks just delicious will be giving it a try very soon. 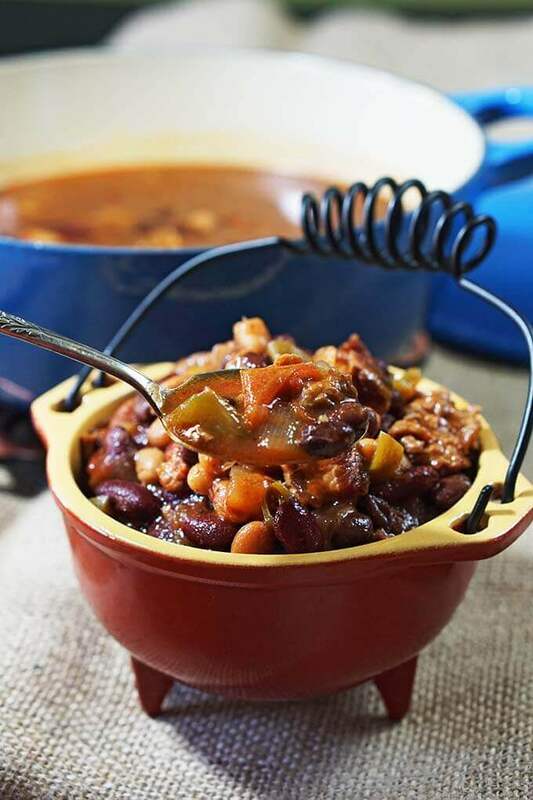 A good pot of beans simmered on the stove is always the best meal!